We are experts at making high quality driveways and retaining walls on steep properties. 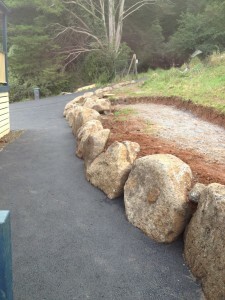 Topcat Driveways has been serving the Dandenong Ranges asphalt driveways needs for decades. Mt Dandenong is located to the east of Melbourne, not far from Ferntree Gully. Driveways in this area often suffer from drainage and runoff problems. In some areas, unstable ground makes access extremely difficult. Topcat Driveways specialises in producing fantastic looking driveways in the steepest parts of the Dandenong, solving drainage and runoff problems that have been plaguing this south-eastern Melbourne suburb for years. We can even landscape your property while our machines are there, and build quality brick, timber or stone retaining walls! Use the contact form and get an estimate as to what it would cost to fix your driveway with a Topcat Driveways asphalt driveway.